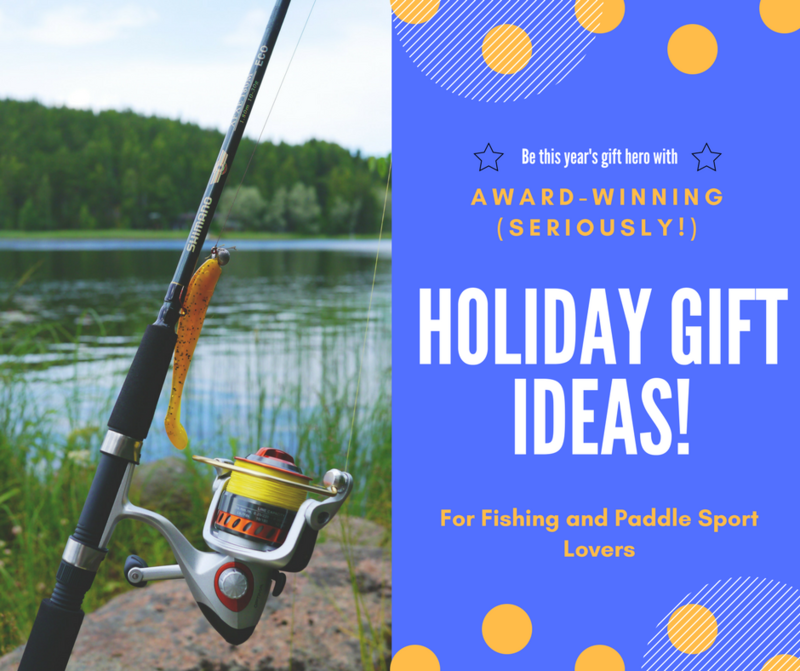 If you have a fisherman or water sports enthusiast in your life and you’re unsure of what to get them this holiday season, look no further! Not only are all of these great gifts, they’ve been tested and approved by experts in the industry. All of the following items have received awards in recent trade shows, judged by leading figures in each field. So you can buy and give these gifts with confidence that your friend or loved one will love it! ICAST is the world’s largest sport fishing trade show. It features the latest innovations in fishing gear, accessories, and apparel. These were picked by a panel of expert judges as best in their categories. A 100% dry duffel bag. Submersible and tough as nails, the Panga is designed for extensive backcountry stays, epic fly fishing adventures, and remote hunting trips. 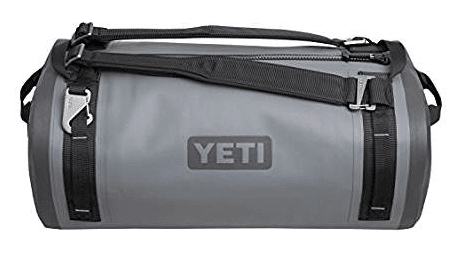 Completely airtight and rugged as hell, this is the go-anywhere, do-anything duffel bag built for adventure. All the features you’d expect to find in an adult rod, but in a kid-friendly size. Get Jr. started early with these fun rods. Real fishing rods, not kids toys. Massive diving lip allows the Rapala to dive deep. Can be run up to 13 knots for big game fish worldwide. Compact and ergonomic design built tough enough for tournaments. Centrifugal breaking system to control spool speed which gives easy to manage spool control and break force. 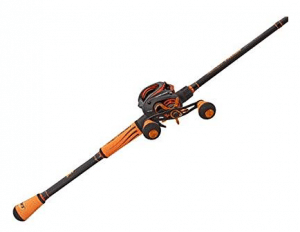 Lightweight and durable, this rod and reel combo was built to provide anglers with smooth and reliable fish-fighting power. What makes the rod so remarkable is its use of 9 double-shielded stainless steel ball bearings for smooth retrieval. Composed entirely of non-corrosive components. This rod has been designed to eliminate all transitional points, which aids its smooth action and increased sensitivity. 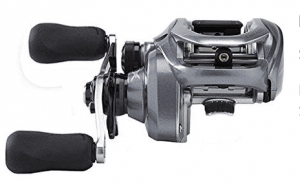 Each component was thoughtfully designed for ultimate sensitivity, a “must-have” feature for reeling in big fish. Every year, the team from SUPConnect travels to the Outdoor Retailer Show where they announce their ‘Gear of the Year‘ awards for various product categories. Here are some of the picks for this year’s winners. In order to win the prize for Best Overall Gear of the Year, the item must meet two criteria: a distinctive offer and broad appeal. The Surftech Generator meets both criteria. 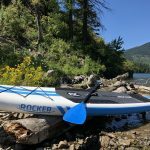 With its thoughtful design for paddlers of all levels, appealing graphics, and affordable price point, it’s easy to see why the Generator was voted Best Overall SUP by readers, retailers, and the editorial board. The Fusion StereoActive was created by a group of sports enthusiasts specifically with stand up paddling in mind but is suitable for all water sports. 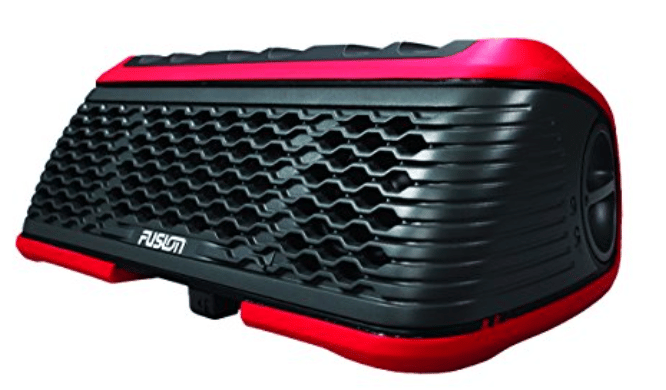 Here comes an innovative new portable speaker that will change the game for water sports enthusiasts for years to come. AM/FM/Bluetooth/USB capable plus fully submersible and floatable, this is the outdoor stereo system you need before you even think of heading out on your next excursion. This is the fishing SUP that beat out over 80 other boards for the coveted Best Fishing SUP award. 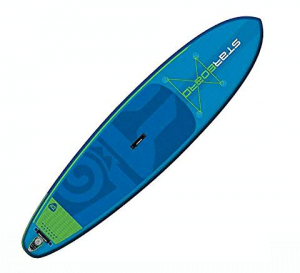 It offers amazing functionality for fishing, eye-catching graphics, and is made by the leading innovator in the fishing paddle board market. In fact, BOTE also won Best in Show at this year’s ICAST convention (mentioned above) for their state-of-the-art motorized fishing SUP, the ROVER. If you want the best of the best in fishing SUPs, once you go BOTE you’ll never go back!  Click here to see more fishing SUP options from a previous review I wrote. Full disclosure: this isn’t THE winner of best inflatable SUP but it’s the winner’s little brother. The true winner was the Starboard Touring Zen (which isn’t available on Amazon). The Blend Zen is the slightly smaller version of the Touring at a respectable 11’2″ long and 32″ wide. 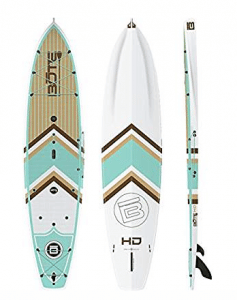 Starboard is widely known as one of the best SUP manufacturers around and is the preferred brand of many tournament racers worldwide. The Blend Zen meets Starboard’s usual exacting standards and embodies all of the unique technological advances that Starboard is known for. 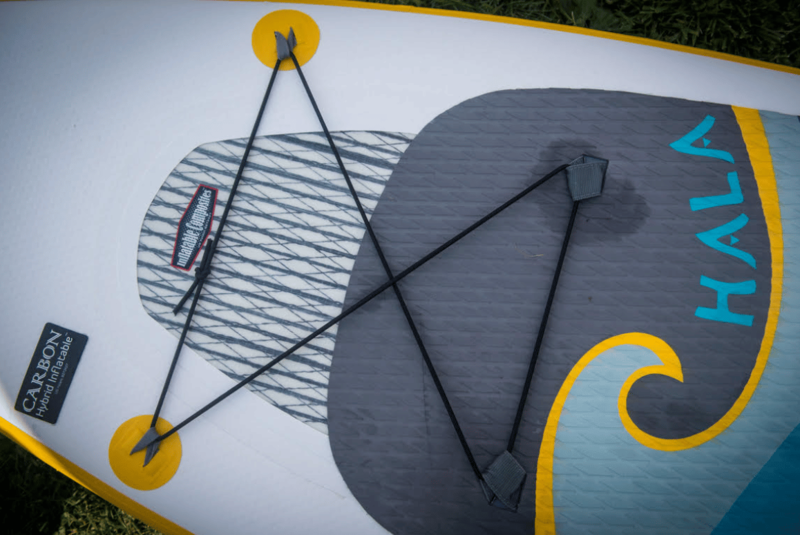 Starboard is the Audi of the inflatable SUP world — renowned for quality and excellence.  Related: Click here to find out about another favorite Starboard SUP. 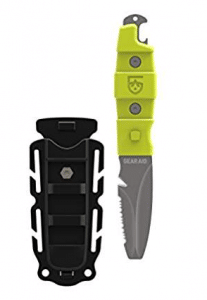 While there weren’t specific award winners at the new Paddlesports Retailer trade show, multiple outlets reporting on the event recognized these items as some of their most exciting finds at this year’s show. This is the ultimate river-running ISUP loaded with features. 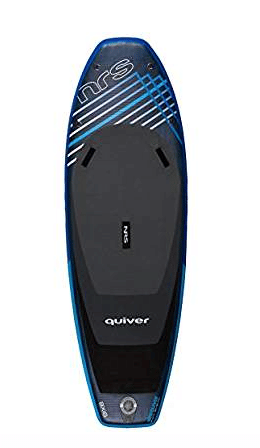 With a river specific fin set up and well-placed grab loops, the NRS Quiver offers the most in both maneuverability and stability. 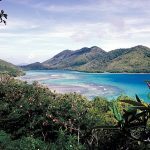 Another recommendation from SUPtheMag.com, Hala has finally come up with a solution to a common ISUP problem: not being rigid enough. 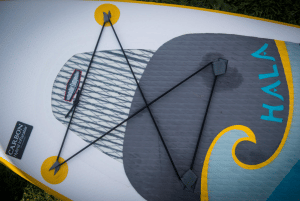 In their newest designs, Hala has implemented a carbon fiber weave stringer that give the boards a super rigid structure that make you forget you’re paddling an inflatable. When you combine that with the bevy of other features offered, like a rolling backpack and industry-leading 3-year warranty, you’ve got the makings of an exciting new product in the uber-competitive inflatable SUP market. 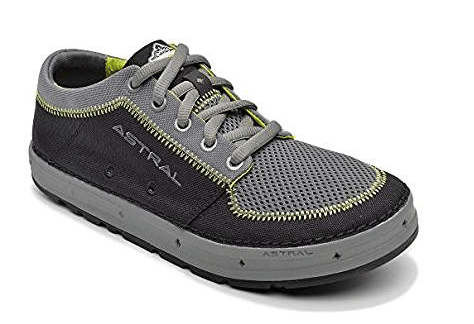 Astral is giving a facelift to its extremely popular Brewer line of water shoe. With an array of stylish colors and designs, these shoes are as comfortable on land as they are trudging through river beds. Amazing product for anyone who spends as much time under the water as above it. Featuring a quick release sheath for easy access and a blunt nose to prevent punctures to inflatables. The blade is also handy as a screwdriver or pry tip for digging into shellfish. And what self-respecting knife doesn’t have a bottle opener on it? Great multi-tool for any diver or water baby. What good is an epic outdoors adventure if you don’t capture it on camera? Pics or it didn’t happen, right? Gnarbox is revolutionizing how we record and upload images and videos by allowing us to do it in the field! No more waiting until you get home hours or sometimes days later, upload your video instantly. Use the app to edit your photos and video and share it with the world. 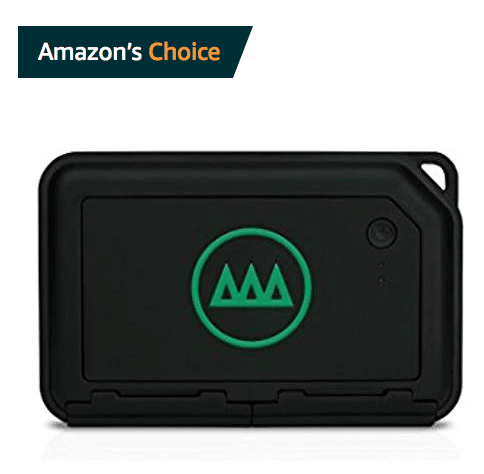 Gnarbox is the portable software, hardware, and storage solution you’ve been looking for that is built for use in the field and travels easily. Ok, these may not be award-winning gifts, but they will be the perfect complement for any of the above items! Not only will you be gifting them with the latest, most kickass gear on the market, you can also allow them to showcase their love of the sport with some cool swag as well. These items make great stocking stuffers and are easy to send. With their fun, catchy slogans, who wouldn’t want one of these shirts, mugs, or stickers in their lives? Size does matter…to some people at least! 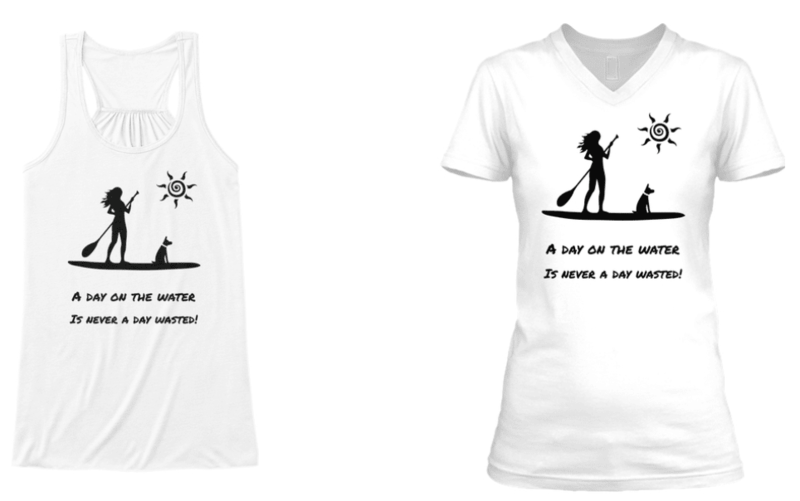 A whimsical play on the smash 80s song, these shirts and related gifts will be the perfect addition to any surfer or paddle boarder’s wardrobe. 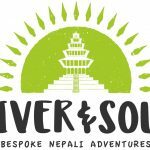 A variety of shirts, coffee mugs, and stickers offers multiple ways to express oneself.  View color, size, and delivery options here! 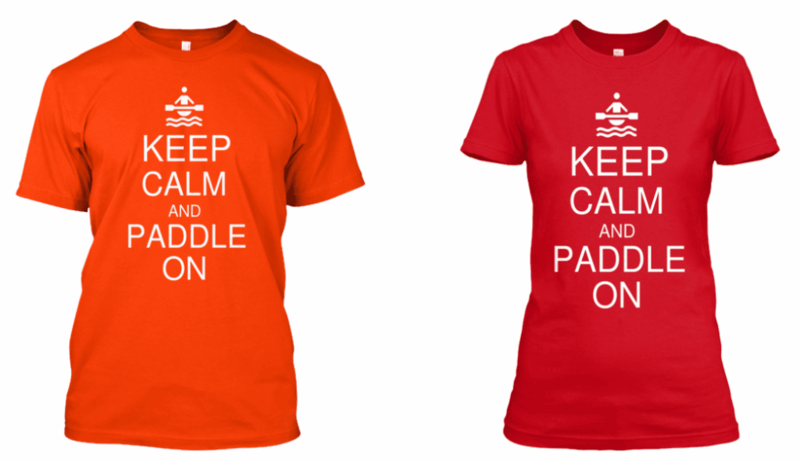 A witty play on the popular “Keep Calm” phrase, this t-shirt is perfect for kayakers, paddle boarders, and outdoor adventurers. Show your love of paddling and the outdoors with this fun shirt that will be the envy of everyone you meet!  Multiple color options available for each shirt. View them all here! 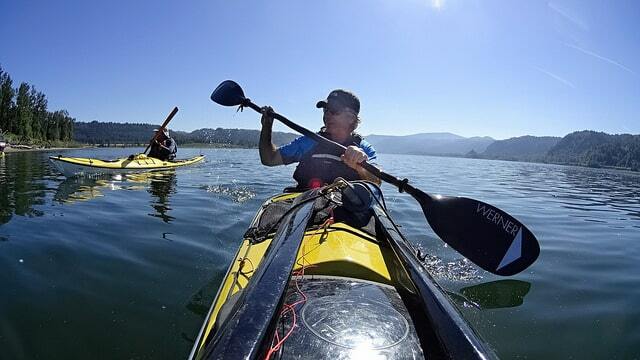 Paddle chicks, this one’s for you! Show your love of paddling with this fun paddle swag! Multiple pieces make for multiple ways to show your paddle pride.  Tropical color options include Aqua, Sea Green, Neon Yellow, and Coral. View them all here! Fun pieces of swag for people of all ages! Stickers go great on laptops, car bumpers, or travel cases. Tote bags are perfect for a day out on the water or at the beach, grocery shopping, and whatever your storage needs. Coffee mugs…because…COFFEE! Need I say more?  More mug and sticker options available here. View them all! There ya have it! Everything you need to be the gift hero for the SUP lover, fisherman, or paddler in your life. 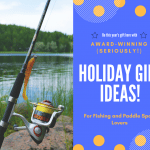 What do you think of these gift suggestions? Which one would you like to most have? Leave a comment below, I’d love to hear what you think!